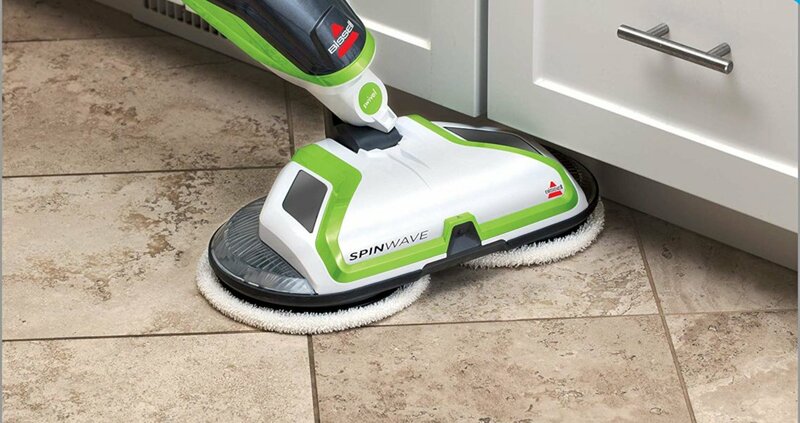 The Bissell Spinwave – is it the hard floor cleaner you’ve been waiting for? Find out in our 2019 review. 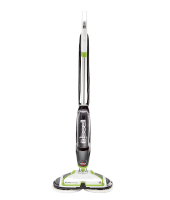 At first glance, you may think the Bissell Spinwave 2039A is a steam mop. But it’s not. It’s an electric-powered spin mop that works like a mini industrial floor scrubber. It scrubs and polishes with counter rotation from two cleaning pads. People with back pain appreciate the self-propelling movement that requires less physical strain than other manual mops. There are a few drawbacks, however, including price. It’s on the high end of the spin mop price range. But we’ll get to that in a moment. Why choose a Spin Mop? There are many types of mops on the market today, from the basic yarn head on a stick to high-tech robotic mops. Spin mops are the next step up from your traditional yarn-head or sponge mops. They’ll cost a little more, but the benefits are usually worth it. Keeps your hands dry and clean. The spinning action, whether powered by the mop or bucket means no more bending over to wring out the mop by hand. Doesn’t leave excess water. You can spin out as much or as little water as you want from a spin mop or even use them as a dry dust mop. Lets your floor dry quicker. Since they don’t leave big puddles behind (unless that’s what you want), floors dry quickly, which is good for sealed wood that is sensitive to water. 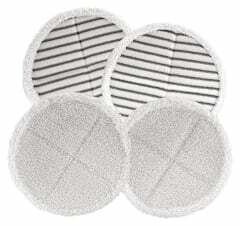 Has reusable and washable cleaning pads. Most of them do, anyway, which is super handy, creates less waste, and ensures you always have a clean pad on hand. It’s also kind of fun to watch the mop head spin around like a caffeinated carousel. 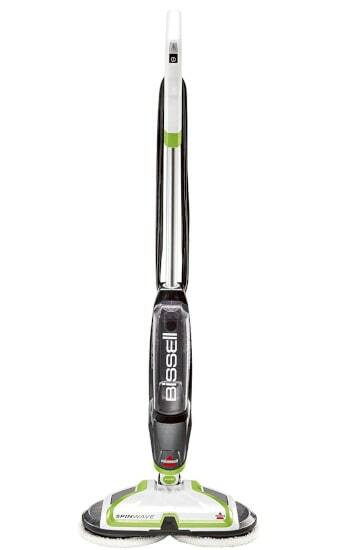 What do you get with a Bissell Spinwave 2039A? The Spinwave comes with 2 scrubby pads and 2 soft touch pads. It also comes with two 8 oz. 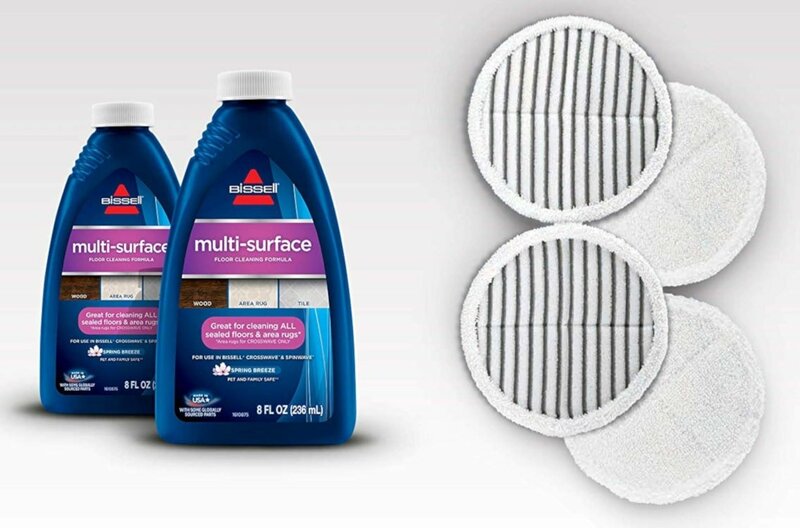 bottles of multi-surface formula cleaning solution. Power spin pads: They work in pairs and spin together in opposite directions. This eliminates the need to run the mop in all different directions to scrub away stubborn stains. Remember Mr. Miyagi’s advice to the Karate Kid? Wax on (clockwise), wax off (counter-clockwise). It’s kind of like that. On-demand spray: The spray trigger on the handle lets you control how much solution gets onto the floor. Use as much or as little as you like. Auto-stop: When you stand the mop upright, the spinning action stops, and you can leave it standing there to move furniture or answer a phone, etc. Self-propelling /swiveling: It’s not technically self-propelled, but the spinning action helps you push it with very little effort. The swiveling head maneuvers around furniture and gets into corners well. Machine washable & dryable cleaning pads: Pop them in the washing machine or top rack of the dishwasher to clean them (don’t use fabric softener or dryer sheets). 2-year limited warranty: Bissell will replace any parts that break or malfunction under normal conditions except for those you must replace regularly, such as cleaning pads. It doesn’t cover breakage from user negligence, self-repairs, or any other unauthorized use (see user manual). 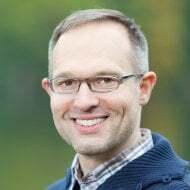 A note on the self-propelling action: Some customers have noticed that the self-propelled movement can get out of control if you’re not careful. Less water in the tank means less weight to help hold the mop steady, so keep that in mind. The entire mop head area is about 14 inches across. In the middle, it’s a few inches tall, so the whole mop head may not fit under very low clearance furniture. The pads stick out about an inch on either side, so it’s fairly easy to clean right up against cabinets, sinks, etc. Cleaning tank capacity – 28 oz. 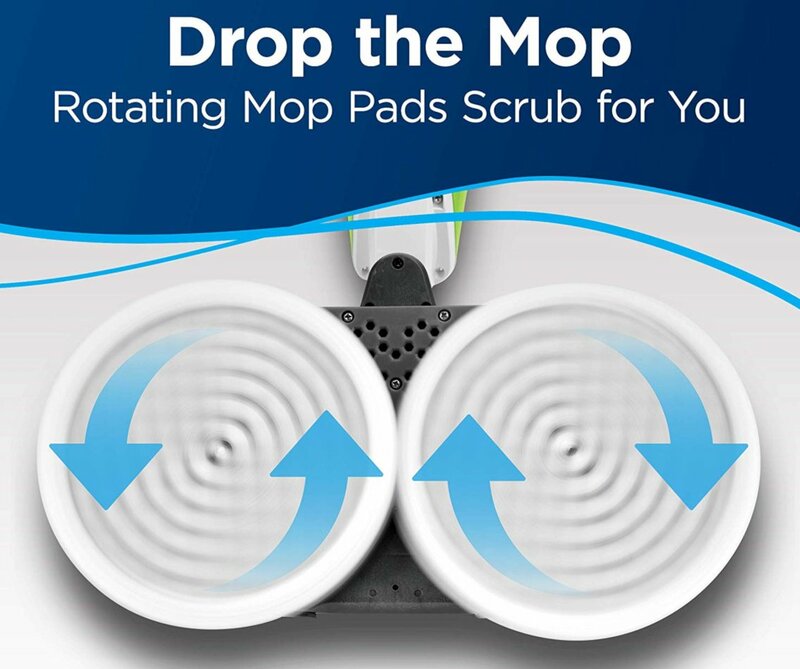 Two types of pads come with this mop – soft touch and scrubby. The scrubby ones are obviously for heavy-duty cleaning. The scrubby ones have bristles for breaking up stubborn, sticky stains but are still gentle enough to not scratch sealed floors. The soft-touch pads are designed for light-duty mopping and dry mopping/polishing. Once you’re done, you can wash the pads in a washing machine or top rack of the dishwasher then air dry them or put them in a dryer. Just remember to NOT use fabric softener or dryer sheets, as that will diminish their absorbency. With proper maintenance, the pads should last several months up to a couple years depending on how often you use them. If you’re looking for something to clean grout, the user manual states that it will clean “shallow grout”. Deep grout lines may be a challenge to clean with the Bissell Spinwave. One homeowner suggested using a little foot pressure to help the bristles get down in there. Cleanup Expert Tip: Make sure the pads are aligned correctly when you put them on the mop, or the machine could vibrate. The tank holds up to 28 oz. of Bissell cleaning solution. First you add water to the water fill line, then add your cleaning solution. On the tank, you’ll see fill lines for both small and large areas so this can help you not waste solution. While you can use tap water, some customers have noticed swirl marks and streaks on their floors. If you notice this, try using filtered/distilled water instead. Also, warm water (not hot) is recommended for better cleaning performance. There is no water heater on the machine. Cleanup Expert Tip: Some homeowners prefer a vinegar/water solution. However, using anything other than the Bissell cleaners in the tank can damage the machine and void your warranty. One suggestion is to fill the tank with water only and use a separate spray bottle for the vinegar. Spray your floor with the vinegar one section at a time, then go over it with the mop. Is the Bissell Spinwave 2039A right for you? Here’s a quick rundown of the pros and cons discussed above to help you decide. Here are some questions homeowners often have about this and other spin mops. Are spin mops good for wood floors? They can be great for SEALED floors of any kind. Hardwood, laminate, or tile flooring that is not sealed should not be wet mopped. They can be mopped with a very damp mop, but any standing water could warp the floor and void your warranty. What’s the best way to avoid streaks? Using distilled or filtered water is one of the best ways to avoid streaks. Also, making sure your floor dries quickly and that you don’t use more water than is necessary are ways to prevent streaks and spotting. What if the pads aren’t absorbing water/dirt? Did you use fabric softener or dryer sheets when washing the pads? Those will greatly reduce the absorbency. Is the pad already saturated with water/dirt? If so, it won’t be able to absorb any more. Try replacing with a clean/dry pad. Is the pad too dry? Believe it or not, if a pad is TOO dry, it may not absorb or move across the floor well. Try misting the pads with water before mopping to prime them for better performance. For about $50 more, you can get a cordless version that’s rechargeable. The 18V lithium ion battery lasts about 20 minutes. Includes 2 sets of pads (scrubby and soft touch).